Noise during construction and building work can be a nuisance to local residents or businesses. Restrictions may be put in place by a local authority to help control the noise levels emitting from the construction site. Our noise monitoring systems will provide you with the measurements and reports that you need. The options for monitoring on construction sites range from hand held meters to fully installed and automated monitoring systems. 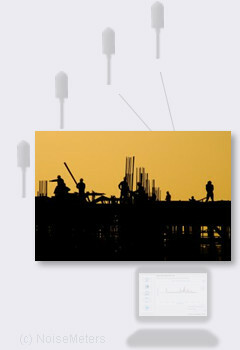 A Class 1 Sound Level Meter (CEL633A1) can be used to make spot checks of the noise situation around a building site. These meters make all the measurements that are usually needed and are easy to use. They can be mounted on a tripod for longer measurements, but are not protected against poor weather conditions. A hand-held meter like this can also be used for noise at work assessments on the site too as it exceeds the requirements of the occupational noise regulations. For short-term construction projects (up to a few months), where it may be necessary to monitor in different locations, we can supply portable noise monitoring systems. These consist of an environmental sound level meter housed in a weatherproof case, connected to an outdoor microphone. Portable noise monitors are usually left measuring for about 1 week, during which time they run on the internal battery and store all the measurements automatically. After a week the unit can be returned to the office or a portable computer can be taken to the site, and all the data is downloaded. If monitoring is ongoing then the battery can be exchanged for a fully charged one. The LiveNoise Noise Monitors connect to your WiFi or Ethernet network. Software running on a computer on your network shows the real-time sound levels, indicates any high noise level alarms and stores the noise measurements for long term reporting. These monitors should be mounted on a wall using four screws. All they need is power and access to a WiFi or Ethernet network. The software needs to run on a computer on the same network, it can connect to multiple noise monitors at the same time. The EM2010 Noise Monitor is installed at the boundary, or wherever else the noise needs to be monitored. It logs parameters such as the LAeq and LA90 every five minutes as required by many regulations. These measurements are automatically uploaded to a web server, so you can view the reports using a standard web browser. These units are designed for medium and long term noise monitoring and are extremely easy to set up. They ship with the mobile connection (GSM / 3G) already installed and working. You just need to deal with the physical installation (mounting the main box and microphone), connecting the microphone and power supply to the noise processor and providing any additional weather protection for the power supply and processor. The EM2010P Portable Noise Monitor is suitable for boundary noise moitoring where power is not available. The battery pack will keep it running for over seven days. Multiple battery packs can be used for swapping on site. The EM2010P unit communicates over the mobile phone network to upload noise measurements to a web server. Reports can be viewed from a standard web browser. The Guardian Environmental Monitor can be fitted with Noise, Dust and/or Vibration sensors, making it ideal for monitoring industrial noise as well as construction and demolition sites. It connects to the Internet over the mobile phone data network, selecting the strongest signal from multiple networks, and uploads its measurements automatically to a cloud server. You can view the reports using a browser or have them emailed automatically.